I know I said that I would be trying a white chocolate and hazelnut mud cake after making my first white chocolate mud cake, although I saw this recipe and thought it sounded so fun and would be perfect for my turn baking for our work meeting. 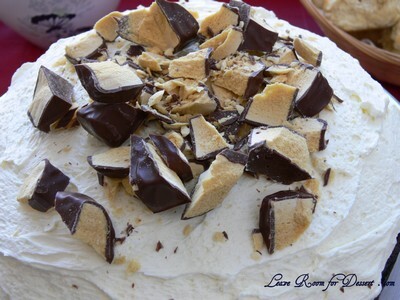 I love anything honeycomb and chocolate so combining this into a cake sounded great and the ganache on top looked lovely and fluffy, even though it doesn’t contain any icing sugar. Due to time restrictions I had to make the cake two nights before the meeting, the ganache the night before and I chopped up the remaining violet crumble just before the meeting so it didn’t soften or go sticky due to moisture. We had to tweak the ganache slightly as I tried to whisk gently the cooled chocolate and cream mixture and it did nothing. It was still very runny. 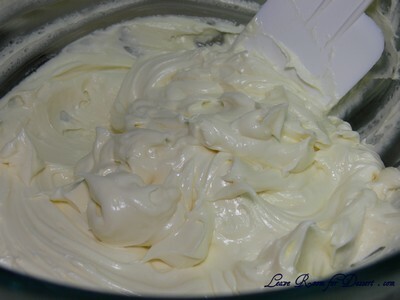 After adding 2-3 tablespoons cold thickened cream (or letting it cool for a lot longer than the recommended time) and beating the mix with a hand mixer, scraping the sides a few times (I found this rest helped it thickened faster) it changed to a light and fluffy ganache. 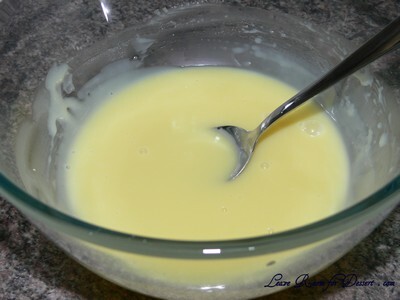 Stir white chocolate, butter, milk, sugar and vanilla essence in a saucepan over low-medium heat until melted and smooth. 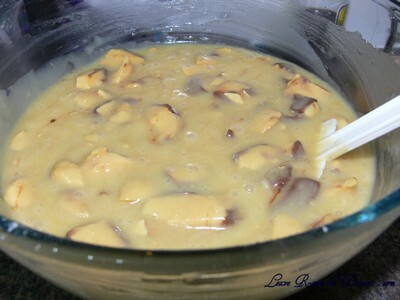 Pour into a large bowl and leave to cool for 25 minutes. Preheat oven to 160C or 140C fan forced. Grease and line a 20-22cm round tin with baking paper. Add eggs and sifted flours and whisk to combine. Fold through Violet Crumble. Pour into prepared tin and cook for 1½ -2 hours or until skewer combs out with clean or with a few crumbs. If the cake starts to brown too much, cover loosely with a piece of foil. Remove from oven when cooked and rest in tin for 10 minutes. Allow to finish cooling on cooling rack. To make the ganache, put the white chocolate and cream in a bowl and microwave on high for 1 minutes, stirring half way through. Stir until smooth. Allow to cool for 15 minutes. Just before serving, chop up the remaining Violet Crumble and scatter over cake. Serve. That looks mouth-wateringly rich, I love the sound of the violet crumble making a caramelised top 🙂 White chocolate and honeycomb sounds like a recipe for a intense sugar high! Was it super super sweet? I can attest that the icing on this cake was heavenly! 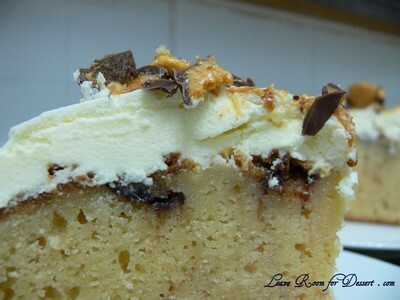 Crunchy violet crumble on top of creamy icing sounds like a wonderful combination of textures. The swirls of violet crumble in the cake look good too! This is the kind of cake that I LOVE! 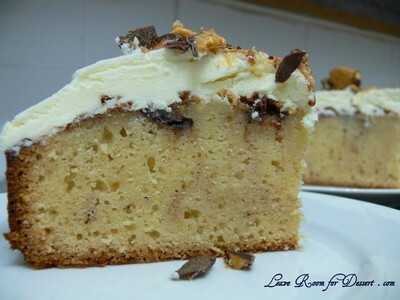 The white chocolate and crunchy honey comb – heaven! I love this cake. The ganache looks divine and the cake so moist and tempting. It doesn’t surprise me that you had to hide the remaining slices! i’m glad you visited my blog because it reminded me to click through and look at yours… and see this. it looks so good. Hi Arwen – Mmmm.. the top of the cake was very lovely..
Hi Leela – It did take a lot of work to try and save some… but it was worth it! oh yum, look at that cake. I want to eat my computer screen. Will it taste like honeycombe though? DRRROOOOL! Ok, I’m trying this recipe out for my daughter’s (22) birthday tomorrow. It was a request and every time I look at your picture I get nervous. Just hope mine looks somewhat like yours tomorrow. It looks so good! 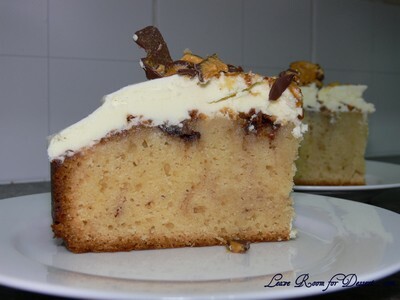 Hi, I’m trying very hard to make your gorgeous looking White Chocolate and Honeycomb Mud Cake. The cake itself is ok but I can’t get my ganache to go all white and fluffy. It looks like yours does in the first picture but won’t thicken. I am using good quality chocolate and thickened cream. I live in Australia and used normal thickened cream so I’m wondering if that’s the problem or if you can guess at what else it could be. I so want to successfully make this cake and ganache. If there is any advice you can give or could you tell me what brand chocolate and what type of cream you used. I’d really appreciate it. I willing to try it a couple of times to get it right. Thanks! Just wanted to let you know that I had success with my second attempt, although it took an hour of beating the Ganache with electric beaters. Thanks for this great recipe! 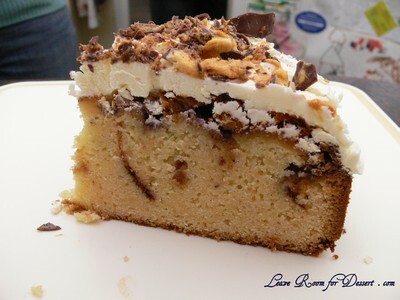 yum im going to make this now! 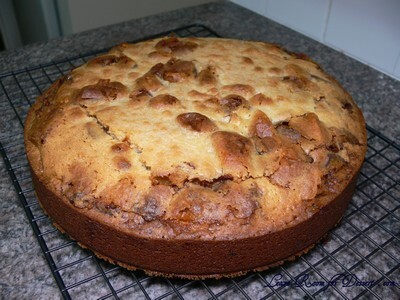 Just made the cake which is now in the oven…but had more cake mix than would fit in 22cm (9 inch) cake pan. Put the rest in small tin which I’m imagining will cook more quickly. Hope to taste it before we bring to dinner gathering this evening. Anyone else have this happen? Hi, I want to make this cake for my son’s birthday. I plan on freezing it to take away with us, how do you think the ganache will fare ?? I would really love to try your recipe. But as i went through the ingredients, I’m not sure what’s cold cream extra. Can i get it in coles? Thanks for your comment, and sorry for your troubles with the icing. 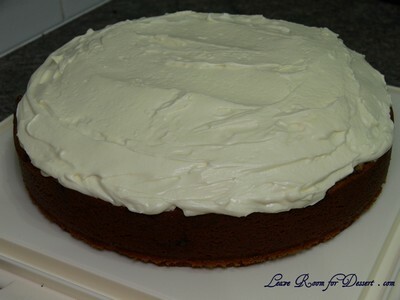 It is a very temperamental icing, I have different problems each time I make it. I find that if the icing is too warm, the cream won’t thicken and just stays sloppy, but sometimes when I cool it too much (put it in the fridge or add cold cream), it can split. When mine had split, I had to heat it slightly in the microwave and then cool it again. Recently after making it, I left it at room temperature for 30min – 1 hour (without the cold cream) and then I could beat it to nice peaks. I hope this helps, as I know your frustration.